I don’t really like canned energy drinks, so I don’t even look at them when I’m at the grocery store. Luckily a relative saw these (good eye, Mom), and got me a couple of these cans of Red Bull with Pac-Man on them, so I’m going to show them to you all here and explain why they have Pac-Man on them in the first place! Anyway, here’s a bigger shot of the cans. 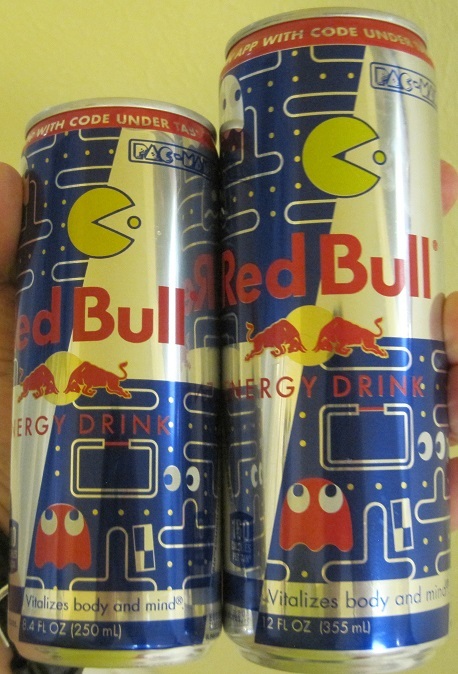 So why put Pac-Man on Red Bull? Well if you download the Pac-Man app on your mobile device, you can choose to play special Red Bull mazes for a limited time (until March of 2019 I think). There are codes on the bottom of the lids when you open them, and when you enter them into the game, you’ll unlock more special mazes. These mazes have a new power-up, too. If Pac-Man eats a can of Red Bull, electricity will rotate around him, and if a ghost comes in Pac’s ‘line of sight’ either horizontally or vertically, no matter how far away, they’ll get zapped and have to go back to their hideout as eyes. Just like when you eat them after a power pellet. And that’s pretty much it. Normally I don’t mind commercials in games, but this one seems a bit off putting to me. Maybe it’s just because they’re using my favorite video game character to shill something I don’t like, I don’t know. There’s another cross promotion featuring Pac-Man on mobile devices, this time featuring the new movie Wreck-It Ralph 2: Ralph Breaks the Internet. You can download a separate app called Ralph Breaks the Maze. The app plays just like Pac-Man, except Wreck-It Ralph and Fix-It Felix roam the maze as well. They don’t hurt you, but they do affect the maze. There are special walls that can block your path. If Ralph walks by them, he’ll break the walls, and if Felix goes by, he’ll fix them again. In a way, it kind of reminds me of Pac & Pal. You can enter codes to unlock new mazes here, too, but I don’t know how you get codes for these. Neat. I’d like to have one can as a collectible. I don’t drink it either.